BRUSSELS, Belgium -- The European Union will not formalise any deal it reaches with Ukraine at a summit on Monday, EU diplomats said on Friday, even as the country’s president expressed confidence that an agreement would in fact be signed. Although an EU-Ukraine summit is due to open on Monday, plans for an association agreement to be signed will not go ahead due to tensions over the jailing of opposition leader Yulia Tymoshenko, EU diplomats have said. At stake for Ukraine is an association agreement, a broad framework for relations that encompasses a free trade deal with the EU. But this appears likely to be derailed by the EU’s dismay at the treatment of opposition figures in Ukraine, including jailed former Prime Minister Yulia Tymoshenko. EU diplomats said it remained unclear if the text of the agreement would be concluded, and EU ambassadors had agreed at a meeting on Thursday they would not initial the deal even if it were finalised. The two sides had concluded an integral text for the agreement but were still haggling over a clause in the preamble of the deal, said one EU official. Ukraine wants this to confirm its identity as a European country and thus its eligibility for eventual EU membership, the EU diplomats said. However, the EU wanted to see evidence of improvement in Ukraine’s treatment of political opponents. “We have seen...a number of shortcomings throughout the whole cycle of the judicial process,” said one of the EU officials. Any deal would still need to be ratified by parliaments of all the 27 EU states and the European Parliament before if could be implemented, a process that at the best of times can take many months. However, President Viktor Yanukovich said Monday’s summit marked the culmination of four years negotiations and he expected it to be a success. “We are geared up for the signing of the agreement on association with the European Union, which has recognized Ukraine’s right to become a full-fledged member of the European community,” he told the diplomatic community in Kiev on Friday. Earlier this year, the two sides had looked to Monday’s summit to showcase the agreement. But the EU side has recently been offering an ambiguous construction merely “noting the importance Ukraine attaches to its European identity”. “We will have to see if Ukraine can accept that,” one diplomat said. Diplomats said Ukraine would have to show clear progress in political reform and its treatment of opponents for all member states to agree to ratification. “For our government we do not want to ratify, or sign, unless there is change in Ukraine’s internal politics,” one EU diplomat said. Diplomats said a joint statement from the summit simply acknowledging the talks had been formally concluded may be the best that can come from the summit — but this would be tantamount to a diplomatic failure. And it would come despite the fact Tymoshenko and her daughter have called for the process of concluding and signing the agreement to go ahead. On Wednesday, her daughter Yevgenia, told Reuters the EU should sign, but impose sanctions on Ukrainian leaders. 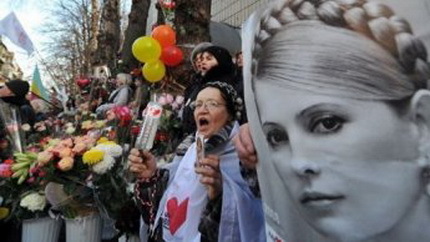 Tymoshenko was jailed for seven years in October on charges of abuse of office. She called the verdict a “lynching” by Yanukovich, her old political enemy, and the EU said it was politically motivated.